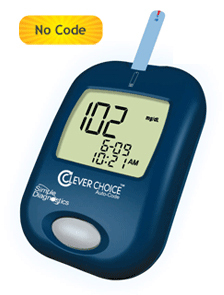 Accurate Healthcare offers the Clever Choice Auto-Code blood glucose meter from Simple Diagnostics because of it’s ease of use. The greatest feature of this system is its one code function which means you do not need to calibrate your meter, and makes it easy to monitor your blood glucose levels. Test strips, lancets and control solution are all provided with the meter.